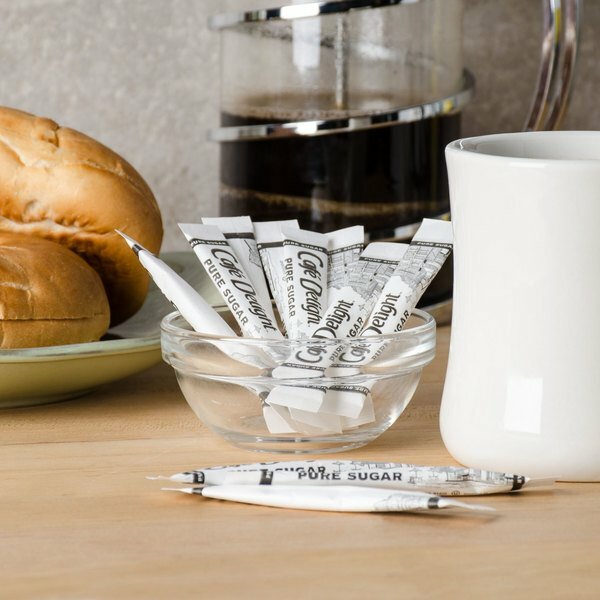 Sweeten your hot beverages, drink mixes, cereal, fresh fruit, and more with these convenient granulated sugar sticks! Featuring a trendy, attractive shape and compact design, these slim sugar sticks provide an alternative to traditional sugar packets. With these convenient sugar sticks, there's no need to worry about filling and refilling your sugar pourers with fresh sugar. Offer these granulated sugar sticks any time you're serving a fresh pot of coffee or tea! In addition to it providing sugar substitutes and artificial sweeteners on your tabletop, you can offer your customers the pure granulated sugar they are looking for! Provide them on your tabletop in a caddy, and they're also great for your patrons to grab on-the-go at your hotel breakfast bar, self-service restaurant, party, or catered event! 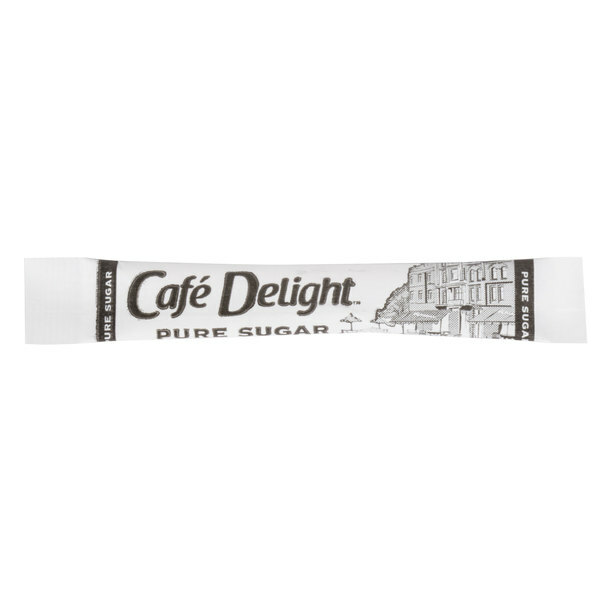 Featuring a simply sweet taste that's sure to satisfy your patrons, these sugar sticks make a perfect addition to coffee shop counters and concession stands, and can also be served as part of your hotel's in room coffee service. Cal-Mil 1260 Adjustable Black Coffee Condiment Organizer - 12" x 12" x 5"
Really good sugar that has a very nice sweetness that you would expect from the more expensive name brands. I really like the stick packaging. perfect for my coffee shop, cute envelope and colors. 100% recommended, nice to use for to go orders also since it holds perfectly on top of the coffee cup. The packs of sugar are perfect for one cup of small coffee. They have a slight slit on the side that caused some major leakage of a lot of the packets. Our customers love the look of the slim design sugar packets. They look more sophisticated then the traditional square packets. I wish you offered this in name brand domino or similar sugar. The granulated sugar sticks are perfect for our tea trays. The sticks are easy to open and pour and are top notch quality. The best price too. A new twist on a classic! These packets look very nice on the tables along with the yellow splenda packets. Customers seem to enjoy the new look! The granulated sugar sticks are great and perfect for to go orders of hot tea. The sticks are easy to open and more sturdy than the paper packets. Your customers will love this granulated sugar sticks and the stylish packaging they come in. The sugar is perfect for your coffee bars and great for your coffee stations. Granulated sugar sticks were just what we needed, 2000 sticks loose per case, certified OU kosher with the symbol on each packet. Clean, easy, looks good. It is sugar and it tastes like sugar. What is interesting about these is the package. I though prefer the packets. They are easier to put all together. I love this sugar. The stick packages are so much easier to open and do not leave sugar all over the table when you open them. Will be buying the again. No complains, has sturdy paper but easy enough for the customer to tear off. Comes packed well in a nice sized box. We would recommend. The packaging design for the sugar sticks really sets this product apart from the typical sugar packets, I was very pleased with the up scale design and ease of use for my coffee shop clients. I saw these sugar sticks and loved how they looked. Most coffee shops that I've been to carry the traditional packets. The tall/slim packets really stand out! Love the upscale packaging compared to regular sugar packets. Just the right amount for a small cup of coffee. Pours easily and our customers love them. These packets are great for those who prefer sugar over other sweeteners. The sticks are convenient to use, and are more easy to tear apart in comparison to the square sugar packets. These are great because they take up less space! They are easy to offer in a small cup with coffee service! Great bulk order item!!! We just received our order of these and we love them. They are much cooler than traditional packets and really do set your business apart from the other guys. Comparable price point as well! Highly recommend making the switch!